I think Dressed for Tea–Tea or Miss Tea for short–was fated to find me (or the other way around). 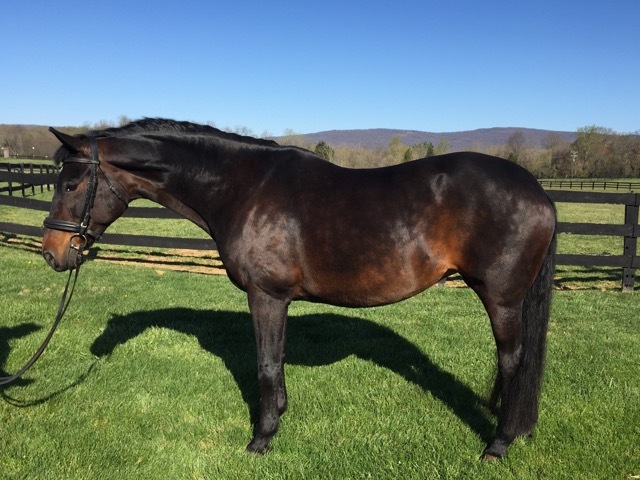 I was looking for a safe, low-level dressage horse who could carry my middle-aged and out-of-practice self to the shows without major drama or trauma. I had experienced enough of that with a mare I raised, loved deeply, but was, in the end, too much for me. I just wanted to have fun! Tea was that horse. Her advertisement boasted that she had shown or trained up to Second Level and had an unflappable nature. She was safe, safe, safe! Like all horse people, I spend far too much time trolling the horse adverts on DreamHorse. I had seen her advertised, but she was far away, and a bit more than I could afford. I looked at a lot of horses, but for some reason kept coming back to Tea’s picture. I first went to see her just after Christmas with my husband and daughter who was home from school. Tea had issues–she was out of shape, she didn’t track straight, she was underweight, she didn’t bend… I went home and thought I’d look some more. I couldn’t get her out of my mind. I kept going back to the videos I took and to her photo. The winter dragged on and I tried a host of other horses. Eventually, I decided I needed to try her again. This time, I did a lot better riding her and I started thinking, maybe if she went to a good trainer and maybe if she got more fit…The trainer representing her, a reputable Grand Prix rider, said she was just out of shape and needed someone who would work with her. The thing about Miss Tea was she’s so was so darn accommodating. She would try her best no matter what mistakes you made, no matter what situation you put her in. I thought, ‘that is a horse worth taking a chance on.’ It wasn’t long before I called to have her pre-vet work done. Red Flags. I wish someone had seen some and warned me.